Pursuant to a lawsuit and Judgment and Injunction of a U.S. District Court against the operators and owners of the website, AllOfChanel.com, which previously appeared at this web address, were held to have been offering for sale and selling replica Chanel items. For authentic Chanel merchandise, please visit the official Chanel website at www.chanel.com. The allofchanel.com online shop offered cheap replica Chanel wallets such as the replica Chanel Long Wallet Black and the Chanel Short Wallet with Silver CC Black, with a 50% off savings for a lower price of $108.00. The low prices offered by sellers of cheap fake wallets are often how counterfeiters attempt to lure unsuspecting shoppers into spending money on inferior goods. The profits derived from the sale of illegal products online are sometimes trafficked into the hands of networks of crime enterprises pursuing other crimes such as identity theft, fraud, and terrorism. Shoppers online are not always aware that many of the replicas purchased on the internet are not only of low quality but are a means to fund further crimes. Averting replica wallets and getting a genuine CHANEL wallet instead is a way to spread feelings of honesty and high esteem to many aspects of life. 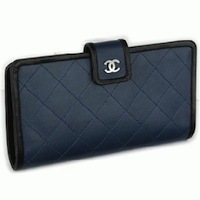 The exquisite quality of a genuine CHANEL wallet will provide the elegance and luxury that only a genuine can. For details on genuine CHANEL, visit a CHANEL boutique and CHANEL.com.